I am posting here because I'm pretty sure a lot of "early" 289 COBRA received the 8K Faria Tachometer(s) back in the day. Any way when I bought my car it had been re-wired to accept a much later (80s) tachometer. Now I would like to return the car back to it's late 1963/early 1964 wiring and tach setup. Going through my boxes I found the original tach but I have no mounting bracket, light bulb holder or instructions as to how it's wired. I was wondering if any of you guys could help me with these things? Since there are no visible markings on the back of the tach, I'm having a difficult time discerning what hooks to what without frying the unit. I am attaching a couple pics of it for reference - any comments or helpful thoughts welcome. In my notes Cobras fitted with 1963 or 1964 model year HP289s prior to CSX2201 usually (except maybe the earliest) received Rotunda® marked tachometers like that and pictures of several unrestored cars show such installations. The holes cut and trimmed into the dash panel by AC was for a larger diameter English instrument so each car to get a Rotunda tachometer also had to get a black painted steel reducer adapter also. More than one early Cobra owner has inquired to me about finding a Rotunda marked one for their cars. Unrestored, not even cleaned up old Cobra's tachometer. Originally the chromium plated bezel of the instrument would have not been plated black and the red V on the lens would have not been there. The steel adapter ring to reduce the hole size inthe panel would have been painted black. A different car with a cleaner unrestored condition. 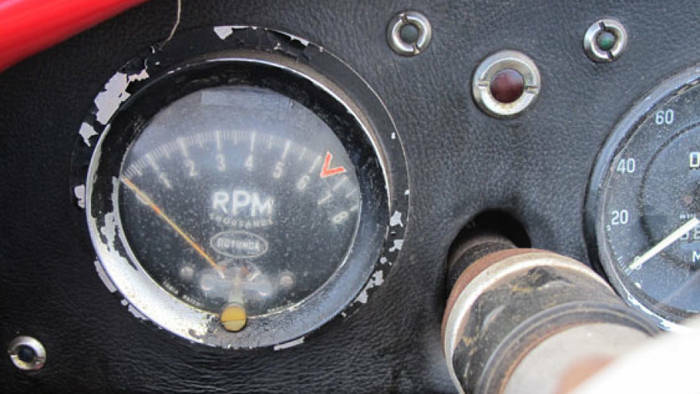 It probably wouldn't be to difficult to have one of the gauge rebuilding outfits modify the face of your tachometer so that it has the Rotunda logo. It looks like the elimination of the "Faria" and the addition of the "Rotunda" is all that is needed. Phil Severence is about the only one that has parts and does them correctly. 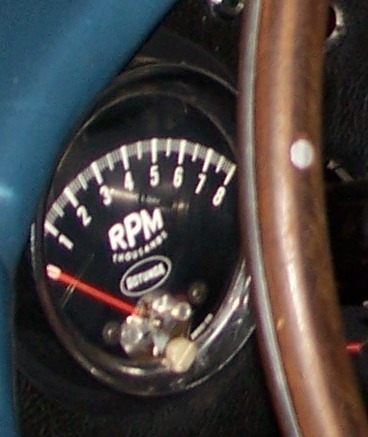 He re-did the tachometer in my '67 Shelby after Tachman charged me for " rebuilding" my Tach and it failing to function, then refusing to honor it's warranty. We won't go into the rest of the samantics from Tachman. I absolutely don't recommend you allow him to touch anything you have. A little research shows both tachs are essentially the same unit built by Thomas G. Faria out of Connecticut. Their website says the company grew immensely once Ford offered the contract to build all it's automotive tachometers in '62. Basically the tach was just re-branded as "Rotunda". This is why I reached out - I've seen 289s equipped with both variations, though as Dan pointed out the Rotunda seems to be the prevailing (and I believe correct factory tach). I think I may have an idea on wiring the unit, but no mounting bracket or light bulb holder. I'm gonna try to look up and find Phil Severence to see if he has any spares. Maybe this seller would make a copy of the instructions for you. There is another that is an alternative and does good work. Bob at Rocketman here in Texas.